Synopsis: Story of a schoolteacher’s struggle to teach violin to inner-city Harlem kids. Review: In 1999, most movie-goers who heard that Streep was starring in a new Wes Craven film might have thought she was taking the lead in a Scream sequel but they would be surprised to see that it was Craven stepping outside of his comfort zone. The Oscar nominated documentary Small Wonders was the inspiration for the feature length story of single mom in NYC who takes a job as a music teacher with an inner-city school. At first her unorthodox ways and strict program don’t sit well with the students, parents, and school officials but faster than you can say To Sir, With Love she changes minds and hearts one bow string at a time. Though Streep (who earned her 12th Oscar nomination for the role) is excellent as always, the movie seems a bit too easy for the actress. Now, I enjoy it when Streep colors outside the lines in films like She-Devil, Still of the Night, Death Becomes Her, etc but I just can’t help but feel there wasn’t a huge challenge in the work being done here. Maybe it’s because the role was originally written for Madonna (don’t cry for her, Argentina…she nabbed Evita, a role Streep had wanted to play for a decade) or maybe it’s that the story is light as a feather. Craven directs the drama with a cursory style…he had long wanted the chance to direct a serious picture and negotiated the option to helm this in exchange for a few more blood and guts films for the studio. It’s a serviceable effort that undoubtedly got more notice because of Streep’s presence. 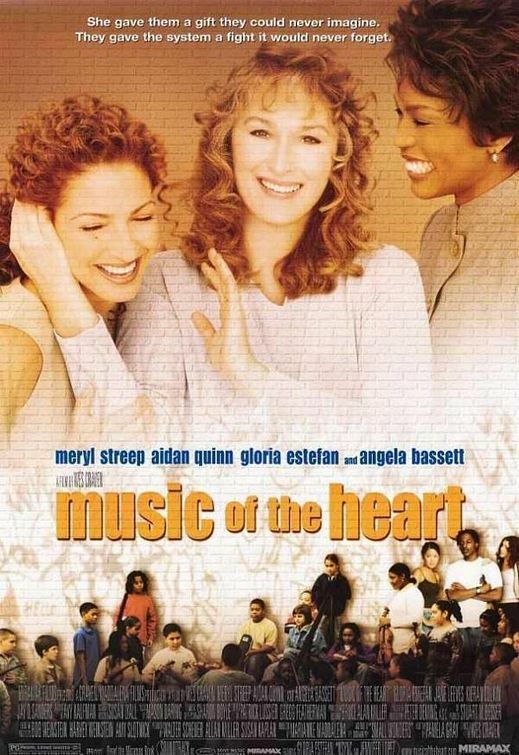 Bringing up the supporting roles are a surprisingly strong turn for singer Estefan and less surprising work from Quinn and Bassett as characters that only pop up to slow things down. I’d strongly recommend the documentary this is based on (if you rent the DVD the doc is included as a valued extra) and see how the feature film compares to the real life people that made Music of the Heart possible.